Abstract: Intestinal metastasis from breast cancer (BC) is rarely encountered in clinical practice. Nonspecific symptoms and long latency result in misdiagnosis as a primary intestinal tumor. Therefore, increased awareness of bowel metastasis secondary to BC and a thorough understanding of the clinical and molecular features, and intervention of bowel metastasis are fundamental to avoid the delay of correct diagnosis and management. Herein, we documented a BC patient who experienced progressive bellyache and vomiting 16 years after simplified radical mastectomy. Abdominal CT scan revealed localized thickening of the small intestine wall and lumen narrowing, initially diagnosed as a primary intestinal tumor. 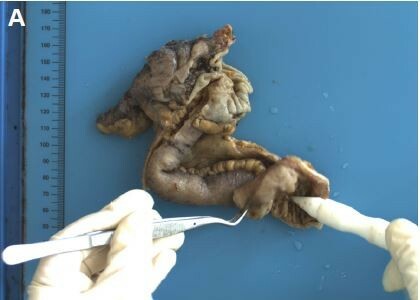 The subsequent operation resolved the intestinal obstruction and confirmed the diagnosis of intestinal involvement of BC. Radical local treatment followed by systemic intervention contributed to a better outcome. Our case indicates that intestinal metastasis should be included in the diagnostic checklist in patients presented with any intestinal symptom even with a remote history of BC. Our case is of great value in its rarity and calls for the awareness of clinicians for this special entity to guarantee the accurate and prompt diagnosis and treatment, and optimize the patient’s prognosis.